FR-4 is the most common used laminate in PCB manufacturing thanks to its excellent physical and electrical properties and low cost. The FR stands for fire resistant and 4 represents the class 4 or category 4. It is made by reinforcing the standard epoxy laminate with woven glass mostly with fiber glass. Typically, a printed circuit board requires to provide a high electrical insulation and static immunity environment for mounted components to enjoy a interference free world. At this point, fiber glass meet the above two requirements which can provide high electrical insulation and have lower moisture absorption properties. That’s why FR-4 PCB board is so popular in the circuit board industry. Some of the basic parameters are as follows. Dielectric breakdown: It represents the maximum potential that a substrate can tolerate without interfering the circuit. Glass materials offer a high dielectric breakdown voltage in the range of 50 kilovolts which ensures a high sensitive working platform. Dielectric strength: It refers to the maximum value per specific that the material can handle without losing any of its insulation capacities. 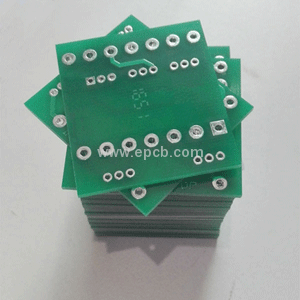 FR-4 PCB has a highly stable insulation strength about 20 MV/m even at a high static field. Relative permittivity: Since the sensitive signal passing through the FR-4 PCB must have a free potential path, relative permeability value should be in the range above 3.5. Temperature tolerance: FR-4 PCB can withstand scorching temperatures of more that 100°C continuously. Water absorption: Moisture in the active circuit region may induce capacitive effect and form conductor between two traces. So, the less the moisture abortion the better. FR-4 PCB can be less than 0.1% which is the lowest of all other kind in resign bonded materials.